The Hazara Encyclopaedia is a reference which provides a vast breadth of information and knowledge about the Hazara ethnic group – one of the four main ethnicities in Afghanistan- and its culture, society, politics and history. The majority of Hazaras are Shia Muslims including Ismailis as well as Sunni Muslims; they mainly live in Afghanistan, but there are many living in Iran and Pakistan as well. The Hazara Encyclopaedia project is one part of a greater and more extensive proposal of the Encyclopaedia of Afghanistan’s Ethnicities, which aims to build a base of knowledge and information of Afghan society and culture as a whole; considering that Afghanistan is comprised of nearly 50 ethnic groups including Pashtuns, Tajiks, Hazaras and Uzbeks, very few extensive and reliable studies have been conducted on them thus far. However, the project will start with the Hazara ethnic group as there are many existing sources of knowledge available, and a number of researchers have studied this group before. The idea was initially proposed by a number of academics and cultural activists in Kabul in the spring of 2011, with the aim of promoting and strengthening academic research on Afghanistan history and society, especially on its various ethnicities. In early 2012, this idea was discussed among a number of Afghan and non-Afghan researchers outside of the country, which resulted in designing a primary plan on the areas of research, the main components of the encyclopaedia and methods of funding the project. The first volume of Hazara Encyclopaedia is being published with a released date of September 2018. 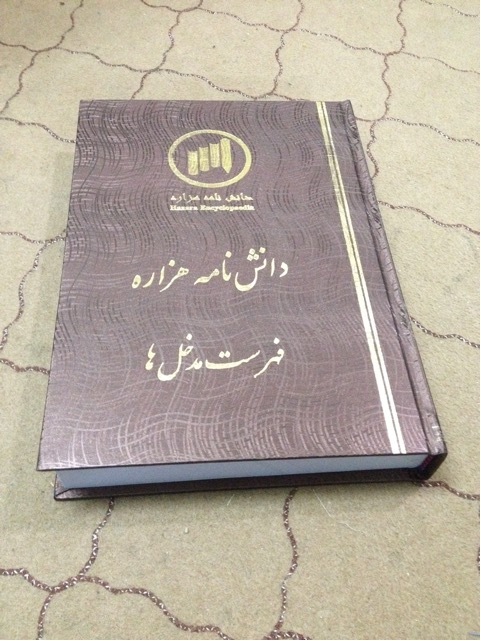 It comprises of 605 entries, with 350,000 words under the first three Farsi letters Aa, A and part of B. More than 40 writers, researchers and members of the editorial board have been involved in the work which has taken more that 4 years to complete. It is in Farsi but translating articles into English has already begun and our aim is to publish the first volume of the English version in summer 2019. It should be mentioned that the majority of the articles/ entries are unique and have been written for the first time, while the others have been completed and changed extensively. Based on our initial plan and estimation, the Hazara Encyclopaedia will be comprised of 12 volumes of approximately 900 pages or about 450,000 words each- every volume will cover nearly 800 entries alphabetically. Each entry is an academic article comprised of a minimum of one hundred words, but not exceeding 5000 words. The time frame for writing and finalizing each volume is estimated to be one year. Our initial study showed that almost half of our entries, including but not limited to the category of villages, require field work due to lack of relevant sources. Hazara Encyclopaedia Foundation (HEF), the founder’s council, is the main governing and executive body which decides on the policy, management and planning of the project. The HEF also decides on the members and structure of the Editorial Board– the main executive body to conduct research, extract entries and monitor the work of authors. The entries, after their extraction from various sources by the staff, will be evaluated and finalised by the editorial board before sending them to the authors to write an academic article on each of them. The board will evaluate, amend and finalise the articles and prepare them for the final editing before publication. The Editorial Board is divided into four categories, according to the areas of expertise and research: History, Politics, Culture, and Geography; they will facilitate, categorize and organise the study and compilation of the work. Each area of research will fall into one of these categories. For example, historical figures come under the category of History, while political leaders fall into the category of Politics. The articles written by the authors will be referred to the relevant members of the Editorial Board. The Hazara Encyclopaedia studies all areas related to the Hazara ethnic group, including language, religion, tradition, customs, media, books, geography, environment and sport. To organize the work in a better way, as mentioned earlier, all areas fall into the four main categories of History, Politics, Culture and Geography. The classification is to facilitate the work on the subject and allocate different subjects to the relevant category of authors and editorial board members. There is no doubt that to accomplish this, there is a vital need for extensive in-depth study about Hazara history, custom, language, religion and other elements of their social and political life, as well as their interaction with other ethnic groups in Afghanistan and the region. Such a task cannot be done without a communal effort by researchers and without the necessary funding and support. Extracting entries has been one of the essential initial tasks. So far, nearly 28000 entries have been extracted from hundreds of books on Hazaras, in 34 topics including places and historical sites (around 3500 entries), names and figures (around 3000 entries), sub-ethnic groups such as Taifa and Tira (around 1500 entries) cultural traditions and customs (around 500 entries), old and new publications and periodicals (around 500 entries) traditional clothes and political and social groups (around 150 entries) and so on. An initial estimation shows that over %90 of all relevant entries in most topic areas have been extracted and finalized by the editorial board, and the relevant sources have been distinguished for each. Picture: List of Entries (nearly 15,000) in 600 pages of A4 size. The task has taken one year of work, and searching nearly one thousand relevant sources on Hazara culture, politics and history.